Hi there! Hope you're having a lovely Sunday. 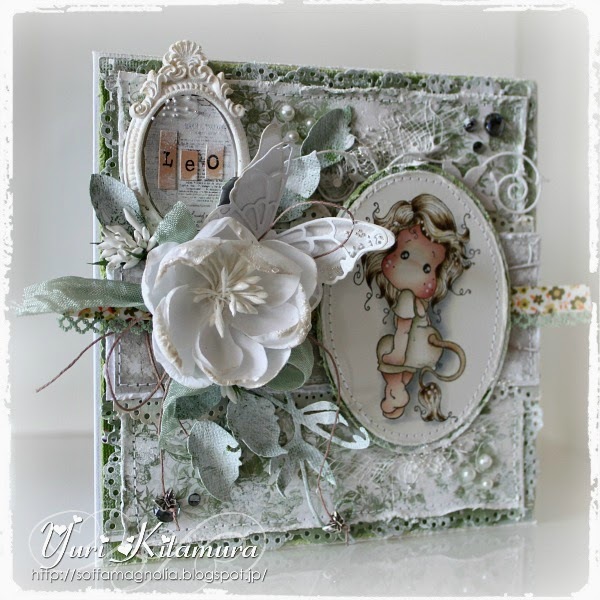 My today's card is for a new Colour Challenge over at The Ribbon Girl Challenge Blog. ♥ The theme is Green. 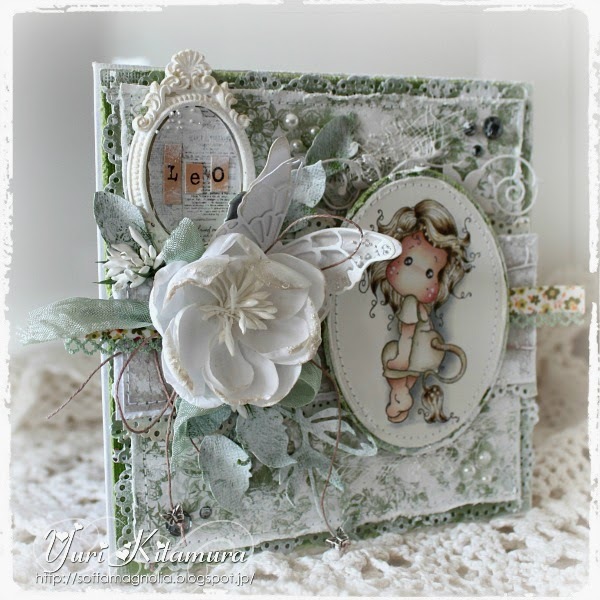 The DT & GDT have made some fantastic creations and if you would like to win a gift voucher from LOTV and The Ribbon Girl then hop on over to the blog and upload your piece of Green loveliness. ♥ For all the details>>Here! I hope you will be able to join us for this challenge! Here is close up of the image from Magnolia's the latest "Zodiac Collection" called "Leo Tilda". She is colourd with Distress ink reinkers. I love the pose on this Tilda, isn't it cute? The gorgeous frame is from The Ribbon Girl. I have coated with gesso, when it dried I have inked with Prima pastel brown quick dry fluid chalk ink, to get that shabby vintage look. Here are the lovely materials from The Ribbon Girl I also have used: Resin Cameo Frame Flatback, Bias Binding Green Lace Floral, Sea Moss Green Seam Binding, Light Brown Hemp TwineStarburst Stamen White, Sticky Tape and Cheesecloth. I have placed cheesecloth behind the image and coated with texture paste, then added some micro beads before the paste gets dry. Thank you so much for visiting my blog, and thank you for all the lovely comments you leave, your comments make me smile! Hope you all have a relaxing Sunday! This is really gorgeous Yuri, I like the tilda image and the wonderful colours. so cute and this colors .. wow !! WOW!!! Stunning Card!! Beautiful Coloring.. The Color theme is Beautiful.. FAB shabby Details. Lots of small things to look at!! I love it! !